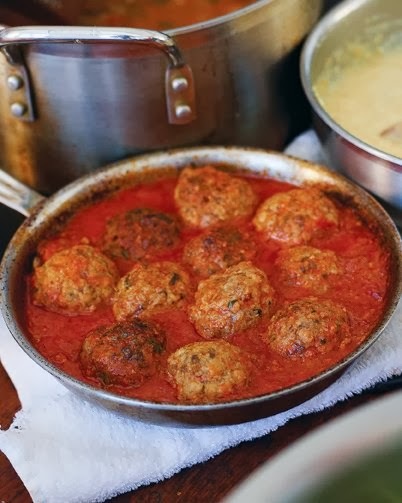 Ricotta cheese helps to make these meatballs moist and delicious in this popular recipe from Daniel Holzman and Michael Chernow's "The Meatball Shop Cookbook." Preheat oven to 450 degrees. Drizzle olive oil into a 9-by 13-inch baking dish; using your hand, evenly coat entire surface. Set aside. In a large bowl, use your hands to mix together beef, ricotta, eggs, breadcrumbs, parsley, oregano, salt, red-pepper flakes, and fennel until fully incorporated. Roll mixture into firmly packed 1 1/2-inch balls. Place meatballs in prepared baking dish, taking care to line them up snugly so that they are touching one another in even rows vertically and horizontally to form a grid. Transfer baking dish to oven. Bake until meatballs are firm and an instant-read thermometer inserted into the center of a meatball reads 165 degrees. Meanwhile, heat tomato sauce in a small saucepan over medium-high heat, stirring frequently. Remove meatballs from oven and carefully drain excess grease from pan. Pour heated sauce over meatballs and return to oven; cook for 15 minutes more. Serve.